Confederate map makers conveniently labeled this battery on the Dimmock Line as a Priest's Cap. The purpose of this configuration was to provide a flank or cross fire in front of the fort or battery. 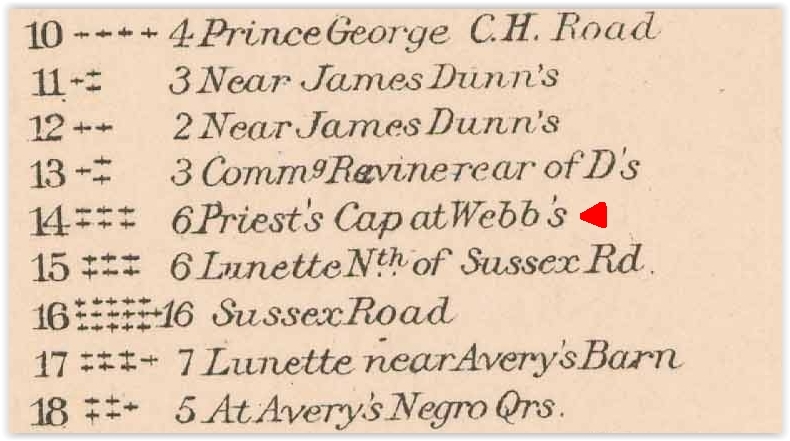 This detail from the Atlas to Accompany the Official Records of the Union and Confederate Armies, 1861-1865, Plate XL, describes Confederate Battery 14 as a "Priest's Cap". The battery no longer exists. The Webb house is also known as the Shand house. The house no longer exists. Another detail from the OR Atlas, Plate XL, shows Battery 14 in it's location near the Webb/Shand house. It was designed for six guns. This detail from a plan drawn by Federal engineers in June 1864 shows the priest cap battery with it's six gun platforms. 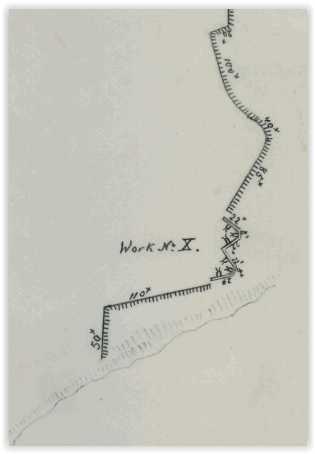 Although labeled Battery X here, it is what the Confederates labeled Battery 14 on the original Dimmock line. Detail from RG 77, Drawer 150-49, NARA College Park. Another image from NARA RG 77, Drawer 150-49, showing a broader perspective. 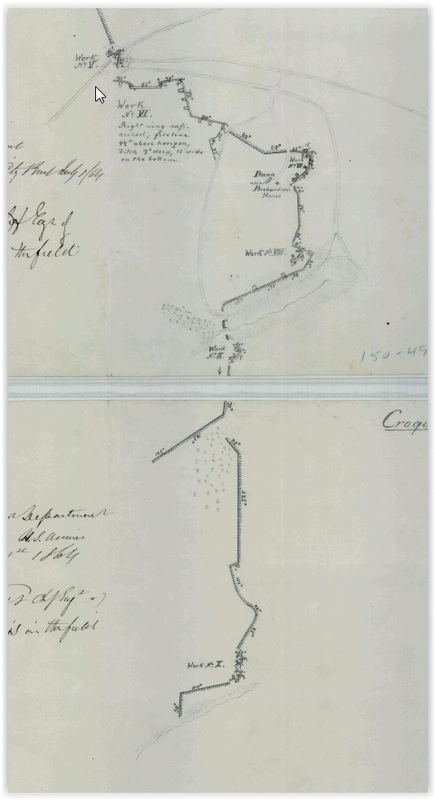 From: Mahan, D. H. A Treatise on Field Fortification, Containing Instruction On The Methods Of Laying out, Constructing, Defending, And Attacking Intrenchments, With The General Outlines Also Of The Arrangement, The Attack And Defence Of Permanent Fortifications. Fourth Edition, Revised and Enlarged. Richmond, VA., West & Johnson, 1862. Detail from Mahan, above, Plate I. Federal Fort Stevenson is another example of a Priest Cap or Swallowtail design, in this case, a fully enclosed fort. Image from Michler 8" to 1 mile. 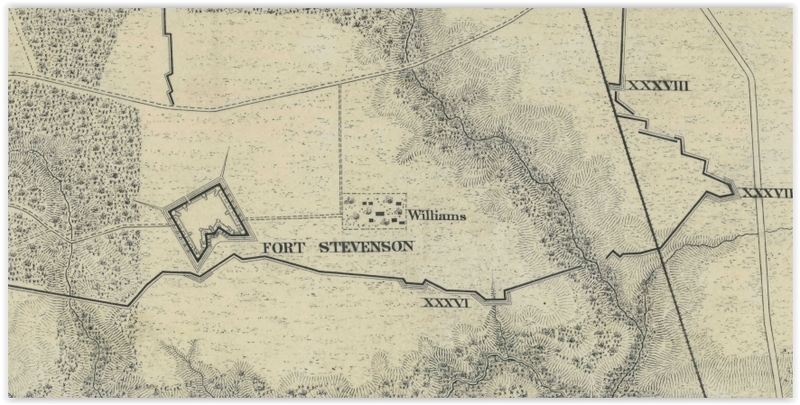 Federal Fort Sedgwick, the notorious "Fort Hell", spanned the Jerusalem Plank Road, a major thoroughfare into Petersburg. In its final form, it is an excellent example of a Priest's Cap configuration. NARA RG 77, Drawer 150.